Ideal posts for schools, available as a hinged or socketed option. Manufactured from 2mm thick steel tube. Bottom uprights 6m long x 70mm diameter. 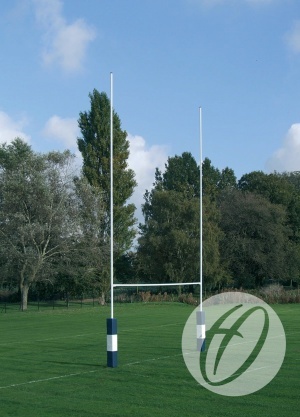 Top uprights 5m long x 63.5mm diameter. Crossbar 5.6m long x 63.5mm diameter. 917mm deep sockets with 73mm inside diameter complete with stabilising fins and base plates. Plastic Internal Lid for 70mm goals.